Antifreeze is an additive that can alter the freezing and boiling points of the coolant in internal combustion engines that use water cooling. As the name implies, the main purpose of these additives is to prevent the liquid coolant from freezing, which can cause extensive engine damage. However, modern antifreeze also allows cooling systems to operate more efficiently by raising the boiling point of the coolant solution. Various substances have been used as antifreeze in the past, but most current automotive applications use ethylene glycol. 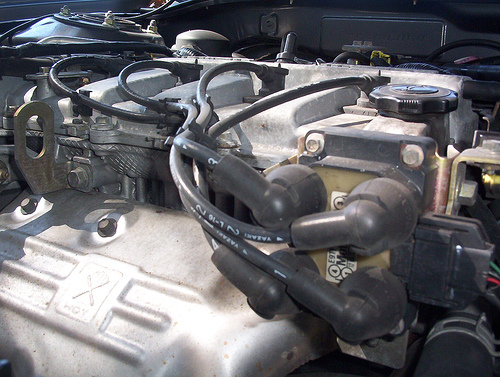 Ethylene glycol is the most widespread type of automotive antifreeze. Naturally colorless, it is typically dyed bright green. 2 How Does Antifreeze Work? The history of antifreeze can be traced back to the early days of automotive engineering. The first automotive antifreeze was methyl alcohol, or methanol, which has a lower freezing point than water. That made it a good antifreeze, but other characteristics of methanol rendered it a poor automotive antifreeze. In particular, alcohol tends to corrode the metals that it comes into contact with inside cooling systems. It also evaporated during normal use due to the fact that early radiators weren’t sealed since early water cooling systems weren’t pressurized. After methyl alcohol, ethylene glycol was the next popular antifreeze to come along. This chemical was first synthesized in the middle of the 19th century, but it wasn’t used as an antifreeze until the second decade of the 20th century. At that time, it was marketed as “permanent” antifreeze due to the fact that it didn’t evaporate like alcohol. By the end of World War II, during which it was widely used to cool military vehicles, ethylene glycol was the dominant type of automotive antifreeze. Ethylene glycol and pressurized cooling systems were so effective, in fact, that air cooled engines were all but killed off in automotive applications. In recent history, a number of developments have been made in the field of antifreeze. Propylene glycol is now used in some applications due to a slightly lower toxicity, and some antifreeze mixtures also contain organic acid technology (OAT) chemicals. The main job of antifreeze is to lower the freezing point of coolant, which is important due to the way that water expands when it freezes. Since cooling systems are closed off, frozen coolant will tend to expand and cause catastrophic engine failure by deforming or cracking coolant passages in the cylinder block and head. Water expands when it freezes, which can spell big trouble for a cooling system. 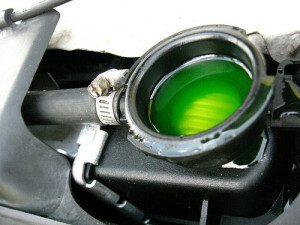 In addition to lowering the freezing temperature of water, antifreeze also raises its boiling temperature. Since the boiling point is also raised by the pressure in the cooling system, this allows engines to run hotter without overheating. 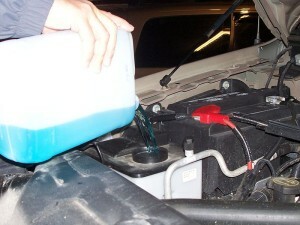 Some windshield washer fluid uses alcohol as an antifreeze. Although ethylene glycol first saw widespread use in the manufacture of high explosives, and it is still used widely in a variety of industrial applications, it is the most common type of automotive antifreeze. It has a freezing point of 9 °F (−12.9 °C) and a boiling point of 387 °F (197.3 °C), which makes it an excellent antifreeze. It is also miscible in water, which means it can be mixed in virtually any proportion to create engine coolant. The one problem with ethylene glycol is that is can’t carry as great a thermal load as straight water. In fact, straight ethylene glycol has roughly half the specific heat capacity as straight water. That basically means that water is twice as effective at transferring heat away from an engine. However, mixing water and ethylene glycol together effectively changes the freezing and boiling points without giving up too much in the area of heat transfer ability. Ethylene glycol provides a good mix of low freezing point and acceptable heat transfer characteristics when mixed with water. Although straight ethylene glycol freezes at 9 °F, and water freezes at 32 °F, mixing them together actually lowers the freezing point even further. 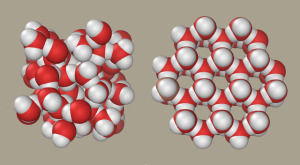 This is due to the ethylene glycol preventing hydrogen bonds in the water, and the water preventing the ethylene glycol from crystallizing. Antifreeze toxicity is a concern due to the widespread use of ethylene glycol. Although it isn’t highly toxic, consuming enough ethylene glycol can be deadly. It is particularly dangerous to pets and small children due to their low body weights and the fact that antifreeze can have a sweet taste. 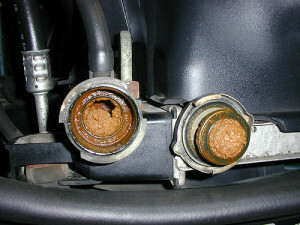 In order to combat this, antifreeze often has a bittering agent mixed in. In some jurisdictions, this is actually required by law. Propylene glycol is somewhat less toxic than ethylene glycol, and it is used in many industries where toxicity is an issue. In fact, it can actually be used as an additive to food products like ice cream and baked goods. It can be labeled “non-toxic,” but it is still dangerous in large enough quantities. Another non-toxic antifreeze alternative is glycerol, which saw brief automotive usage before the widespread adoption of ethylene glycol. It works through the same method as polypropylene glycol, by preventing the formation of hydrogen bonds, but it was too expensive to produce. That may change in the future, and recent studies suggest that it may be a viable alternative to ethylene glycol. 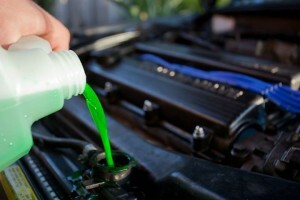 Antifreeze should be checked regularly to ensure that it remains in good condition. It does degrade over time, and that can result in old antifreeze not providing enough freeze protection. 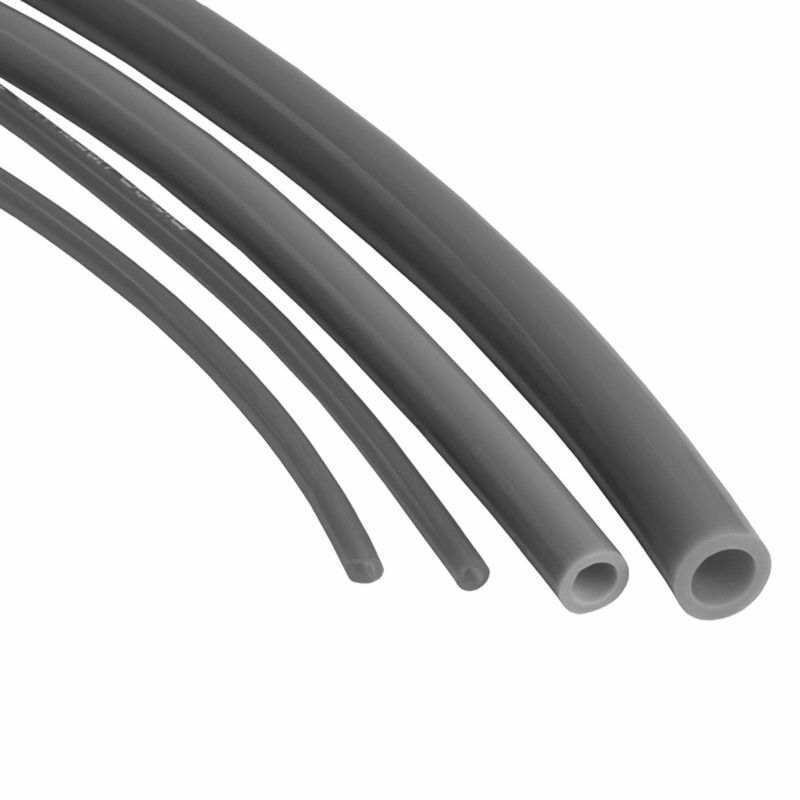 It can also result in other cooling system issues since dirty antifreeze often leads to the corrosion of metal components and erosion of gaskets. Prior to checking antifreeze, it is essential to make sure that the engine is cold. If the radiator cap is removed from a hot, pressurized system, you may be burned badly. If you aren’t sure, then it’s always a good idea to play it safe and wait. Checking your antifreeze regularly will prevent the buildup of sludge and subsequent engine damage. The easiest way to check antifreeze is a hydrometer that measures the specific gravity of your coolant mixture. These devices pull a small amount of antifreeze out and then you read the indicator on a float to determine the freeze protection of the solution. If the freeze protection is low, you can drain out some coolant and add antifreeze. If the coolant appears dirty, then it should be flushed. In addition to simply looking to see if the antifreeze is discolored, you can also use a pH strip to check the condition of your antifreeze. Coolant should typically have a pH that is slightly alkaline (about 9.5 – 10), although you can check with your manufacturer to see what specific pH they recommend. 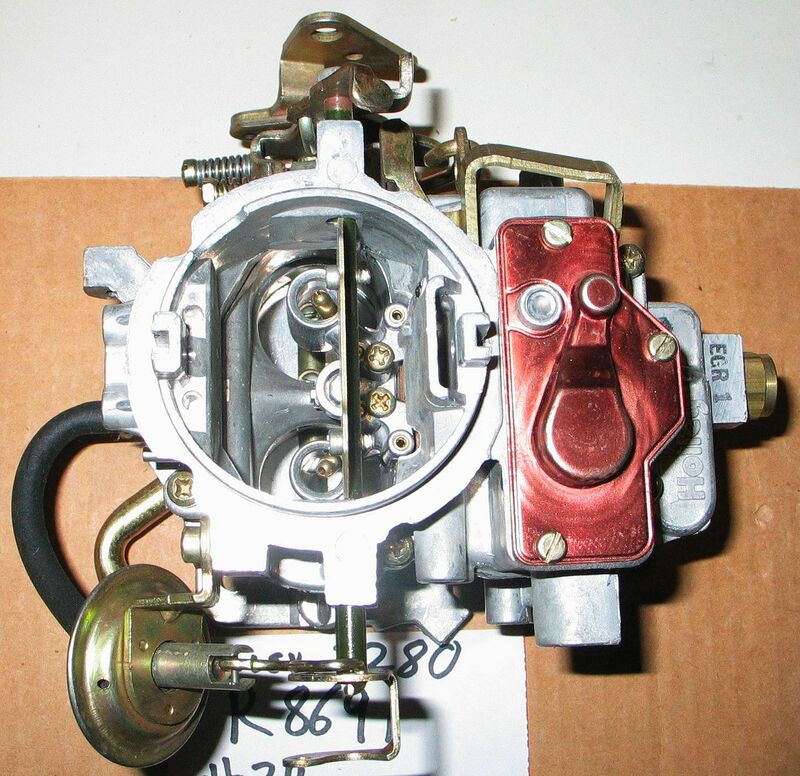 Previous story What is an Automotive Fuse?